Overall dimensions: 50 inches wide x 36 inches deep x 40 inches tall; weighs 59 pounds. The lowest tier is 50 inches wide x 12 inches deep x 4 inches tall with a 70-pound weight limit, the middle tier is 34 inches wide x 12 inches deep x 22 inches tall with a 50-pound weight limit, and the top tier is 18 inches wide x 12 inches deep x 40 inches tall with a 30-pound weight limit. 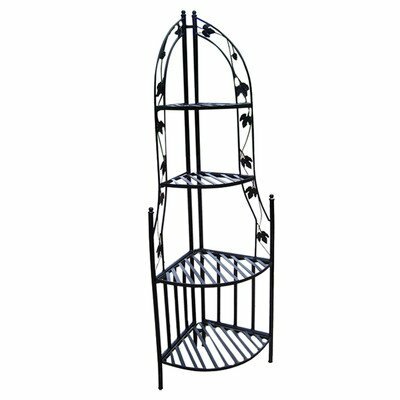 Shelf is made from black powder-coated steel with mosaic tiled tiers for extra stylish appeal and durability. 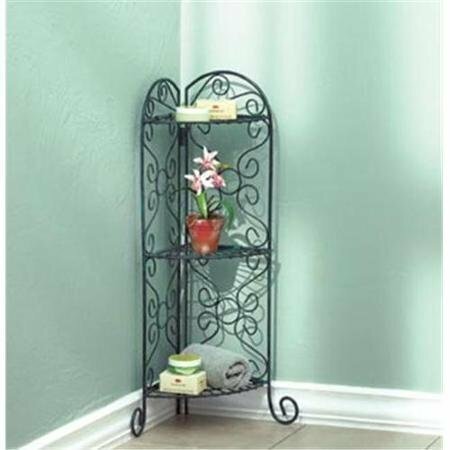 Each package includes one corner 3-tier stand that can hold your favorite beautiful plants/flowers, decorative accessories, books, shoes or anything of your choosing. Overall dimensions: 12 inches wide x 8.5 inches deep x 44 inches tall; weighs 16.6 pounds; weight limit: 17 pounds per tier. The shortest tier is 3.5 inches tall, the middle tier is 18 inches tall, and the tallest tier is 33 inches tall. Folded dimensions: 9 inches wide x 2 inches deep x 44 inches tall. Simply remove mosaic shelves before folding. Shelf features black powder-coated steel frame and blue mosaic tiled shelves for extra stylish appeal and durability. 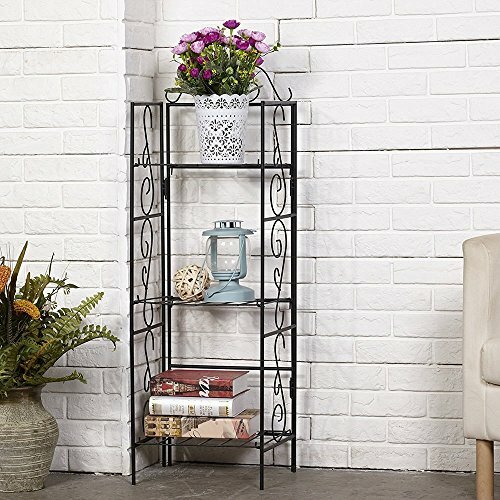 Each package includes one corner 3-tier stand that can hold 3 beautiful plants/flowers, decorative accessories, books, or anything of your choosing. STURDY CONSTRUCTION: durable metal wire shelf design makes the unit less likely to wobble and sturdy enough to safely hold up to 25 lbs. of each tier. 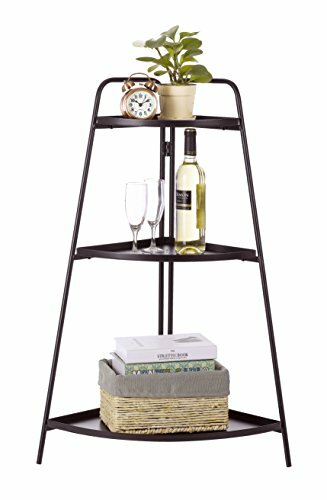 SPACE SAVING STORAGE: by putting the sturdy steel storage shelf at any corners, the 3 tiers stands can work as plants stands, books shelf, bathroom organizer, shoes storage rack and so on and it won’t occupy much space. OUTER VARNISH: a waterproof powder coating protects the shelf from any water, rust, or corrosion, can be used outdoors or indoors. 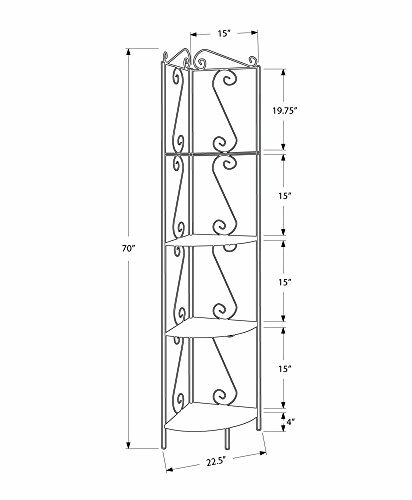 Approximate Dimension : 14x11x43 inches (LxWxH) for 3 tiers shelf, a proper size for all kinds of use as organizing shelves wire rack shelf bathroom organizers or bathroom storage shelves outdoor indoor plant stands wrought iron shelves corner shelf book shelf plant holders greenhouse rack garage shelf shelf organizer kitchen storage and so on. Easy to Assemble: As a storage racks, it’s SUPER easy to be assembled within 1 minute by ONE person, NO tools needed. Also, you can just fold it to flat pieces when you want to move it to somewhere. 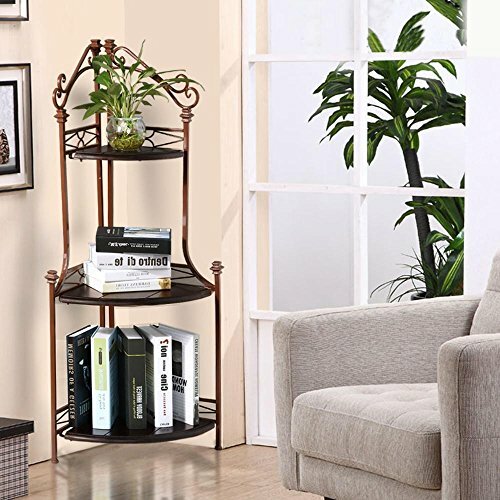 Premium Material: This shelf is made of iron with powder coated finish, the powder coat finish makes the shelf rustproof. 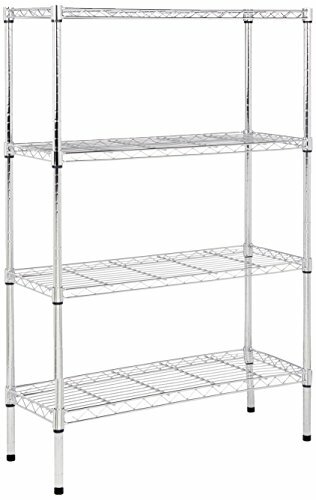 the rustproof standing shelf is stable and durably. Suitable for indoor or outdoor use. 22 1/4″ x 22 1/2″ x 38 1/2″ high. Tapering shelves are 12″ at widest end. Maximum weight 44 lbs. Pretty Corner Home And Office Stand Ornament That Will Hold Mutiple Pots Together. Strong And Sturdy Piece Of Craft That Is Sure To Last A Long Time. Elegantly Designed From Metal Finished With Glossy Garden Green Color That Will Sure To Stand Out In your Corner Area. 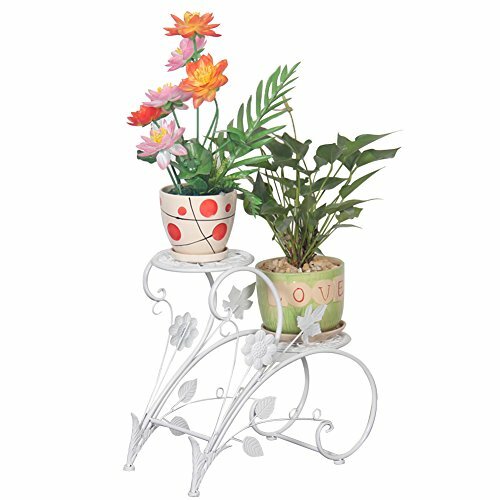 Multi-level plant stand suitable for both indoor and outdoor use. Generous and practical, add more modern twist to your house. Fill up any space with both elegance and natural beauty. Weight 4.2 pounds. 19 1/4″ x 15 1/2″ x 19 3/4″ high. Wrought iron. 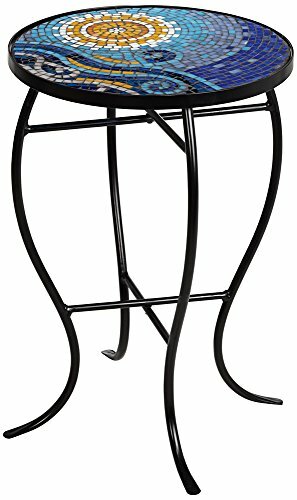 This Stand is Made From Iron Material That Is Sure To Be Strong And Sturdy For A Long And Lasting Use. A Lovely Piece of Craft That Will Create A Beautiful Garden Ambiance. Item weight: 5.2 lbs. 17″ x 16½” x 39″ high. Iron. Plants not included. Best to hold small indoor plant pots. 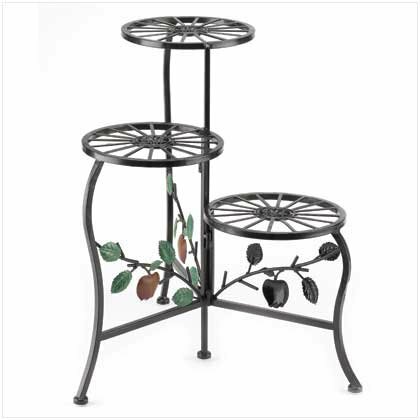 This Stand is Made From Cast Iron That Is Sure To Be Strong And Sturdy For A Long And Lasting Use. Charming And Unique Way of Putting Your Plants That will Surely stand out Among The Rest From Your Garden. 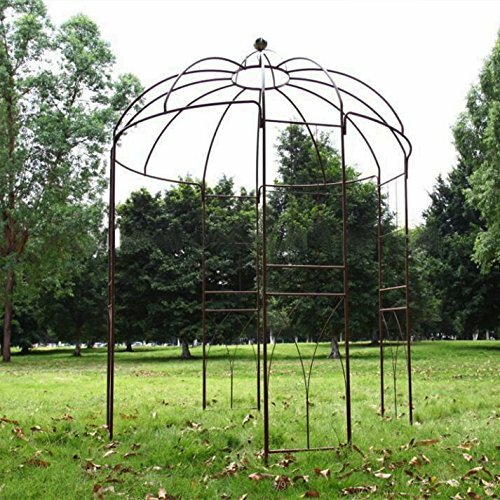 A Lovely Piece That Will Create A Beautiful Garden Nostalgia. Dimensions: 19W x 14D x 52H in. 21″ high x 14″ wide x weighs 7.25 lbs. Ocean scene tile mosaic inlay top. Weight 5 lbs. 19.5″ x 15″ x 23″. Wrought Iron, Pine Wood. Probably the best way to decorate your living room with a lot of elegance is by adding some beautiful plants, because we all know what fresh atmosphere realistic trees can bring to a room and what an exquisite taste flowers (which represent beauty) can offer to a living room's personality. Through the products from our website, you will find a lot of innovative, modern or classical, extremely beautiful and ingenious ways of adding plants to your living room and making it look so much better! It is ideal to position your plants in the corners of your living room because it is there where they will draw the perfect amount of attention - neither too much, nor too less - and where they will look the best, fixing the brightness of your room and making it look cleaner and better organized. Yet, it is very important to arrange the plants beautifully - and this is where the large variety of corner plant stands will help you. Just take a look on our website and you will fall in love with the original and simply beautiful ways of arranging flowers in corner vases, on corner tables or on corner shelving units, or of combining trees with flowers on corner shelves or even in corner pots or curio shops! 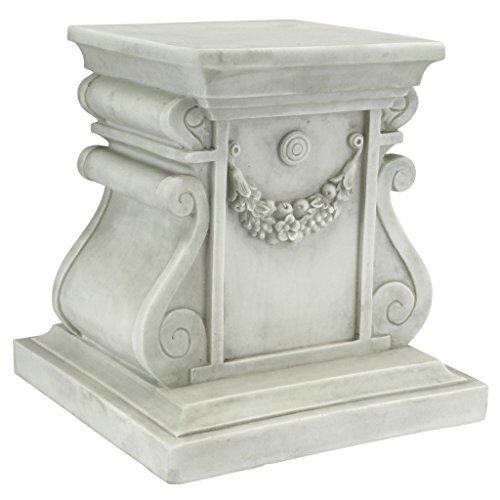 Statuaries, leadder-shaped plant stands and more - you will find all these and more on our website in various designs, shapes and colors, from chess-table like plant stands to mosaic combinations with ocean, antiquity or modernity - inspired coats. Find the best plants and plant-stands for your corners on our website, for your living room's theme and character. Then, make your home more beautiful right now with the help of our website, where you will find the easiest ways to purchase your dream products for your living room! 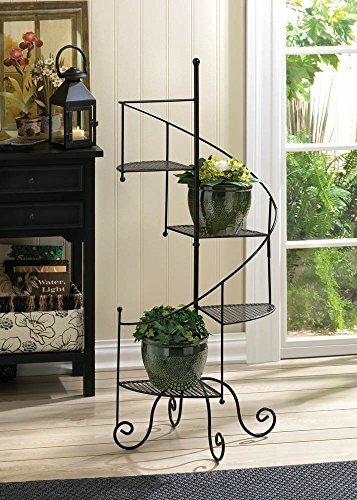 Corner plant stands are a great way to utilize a little extra space in your home or garden while also adding the liveliness of plant life. 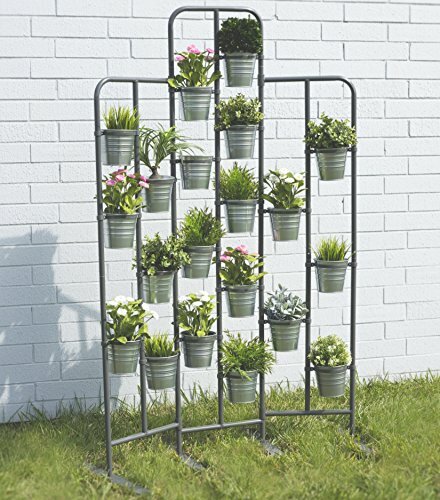 You can utilize the plant stands to display your garden and they can add extra storage space for you. 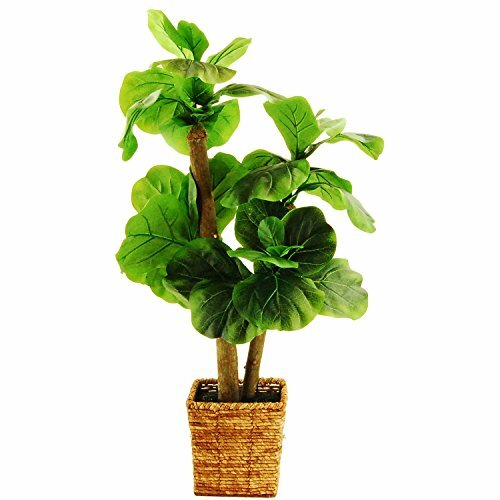 The plants will brighten up your home and give off a positive energy to the space. 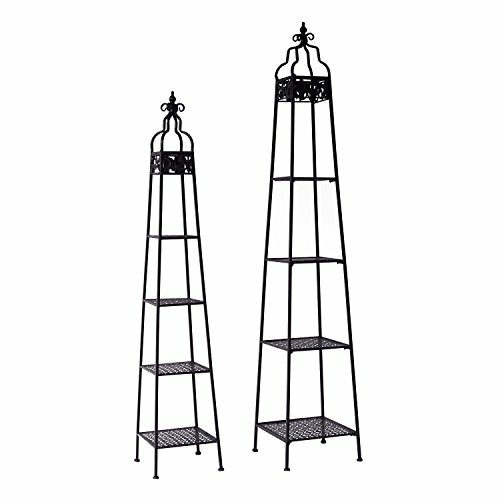 Plant stands are also a great idea if you have no or small outdoor space, but still want to pursue gardening. 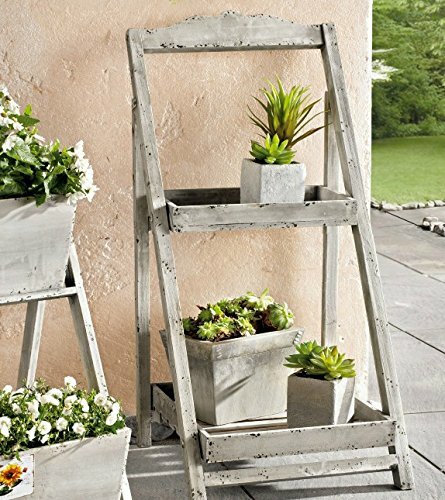 Here are 12 indoor and outdoor corner plant stand ideas. 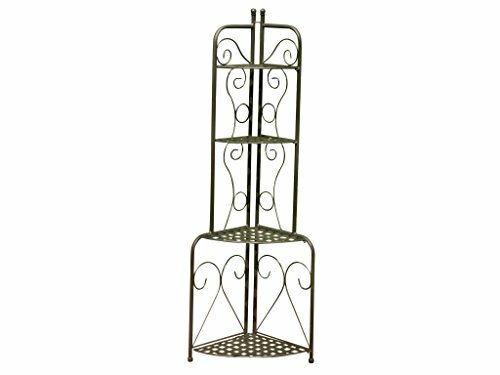 This stand has a nice tiered design to it, which would add an attractive homey feel to any room, or even an outdoor space. 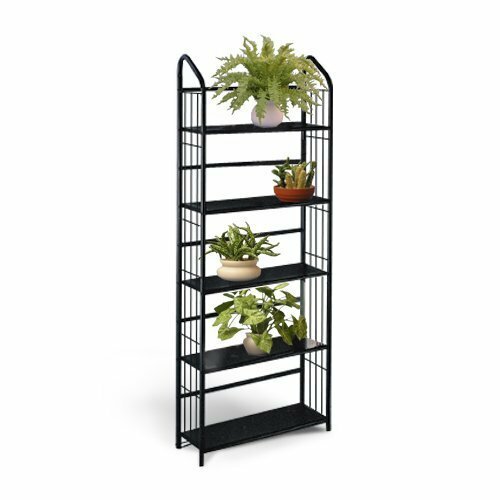 It’s nice that the shelves are different sizes so you can store plants, or even knickknacks of varying sizes, it can hold plants, books, and keepsakes. The construction on this is sturdy and can hold up to 25 pounds on each tier. The varnish has a waterproof coating on it so it can be kept indoors or outdoors without rusting. The whole thing is 35 inches tall, has about 16 inches between shelves and weighs only 2 pounds making it a really great value. 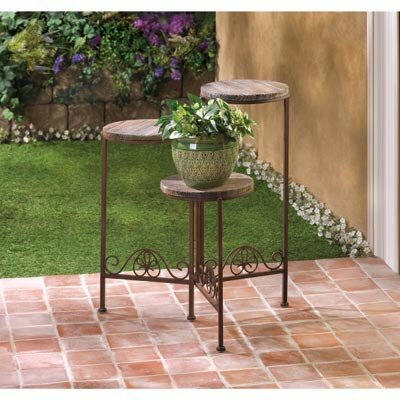 This corner plant stand looks incredible and would add a nice storage area to any room or outdoor space. Wow this corner shelf really displays your items prominently. It’s got a much bigger footprint than some of the others on this list, so make sure you have the space for it--it’s 41 inches wide and 33 inches tall, making it quite the conversation piece. It is sturdy enough to hold potted plants, books, shoes, bags, and keepsakes. This corner shelf is 11 pounds, so it’s definitely strong enough to hold whatever you need it to. There’s a subtle floral design to this piece which would make it great for a patio or balcony. It’s a little more expensive than some of the others, but it might be worth it with the amount of style and extra shelf space this offers. It’s black metal, and has some assembly required. 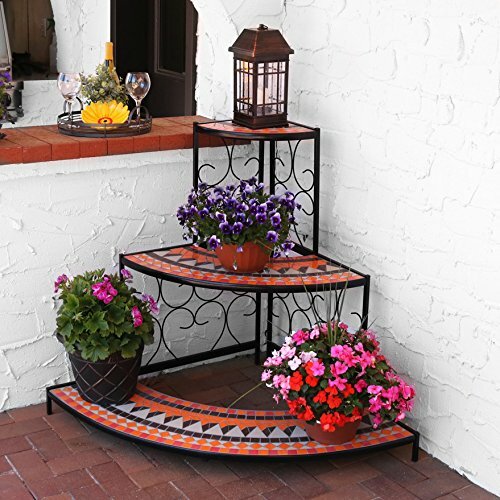 If you have the space for it, this seems like a great corner shelf option--especially if you need to liven up your outdoor space. Wow! This mosaic tiled corner shelf is really spectacular--not to mention big. The bottom shelf is 50 inches wide and the entire unit is 40 inches tall and the entire thing weighs a staggering 59 pounds. 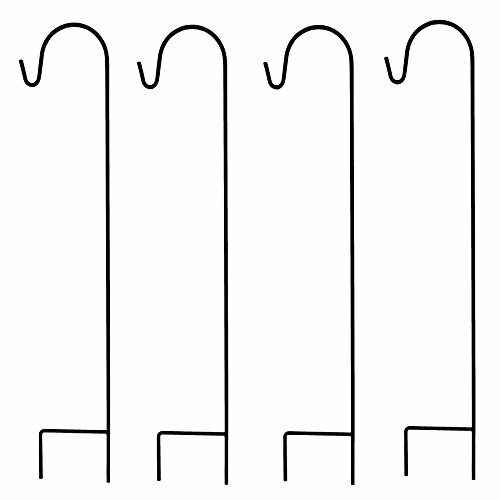 Each shelf has a specified weight limit: 70 pounds for the bottom, 50 pounds for the middle, and 30 pounds for the top, so it should be sturdy enough to hold any and all of your plants. 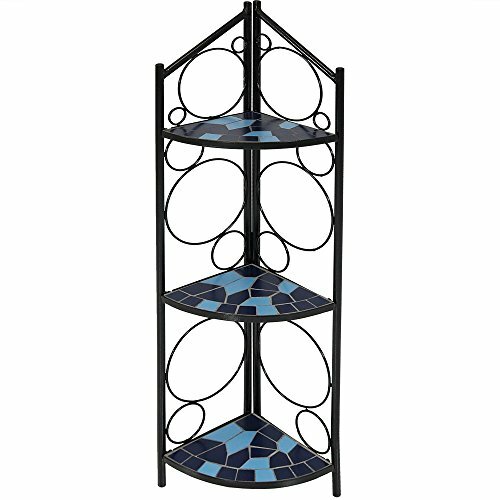 The Sunnydaze 3 Tier Mosaic Corner Shelf is made of steel with clay tiles so it’s both stylish and durable. It can be used indoors or outdoors and comes with a 1 year warranty! Although it looks great, you’ll be paying for it--at $170, this is one of the more expensive items on this list; but those tiles might be worth it! This corner shelf looks great and has pretty good reviews, so if you have the space and the budget for it, this might add exactly what you need to your patio. This corner baker’s rack is a really nice piece! 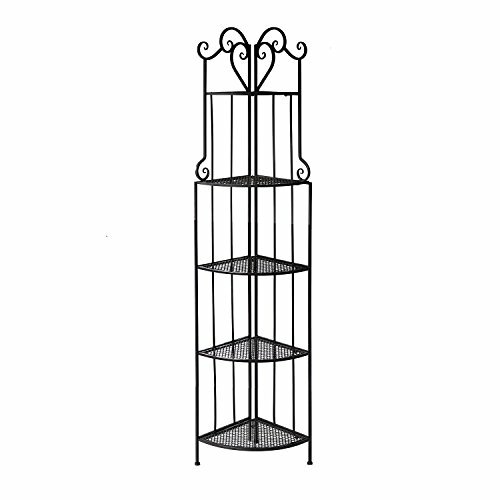 The Brixton Corner Baker’s Rack has four narrow shelves that would be great for holding plates, keepsakes,towels, flower pots, and moore. It’s got a rustic metal design making it great for indoor or outdoor use and it folds up conveniently for easy storage. This would be a great piece to keep in the dining room to store extra plates, or carafes during dinner. The unit is 61 inches tall, and weighs 17 pounds. There is plenty of space between shelves so you can store standing wine bottles, or stacks of spare towels. This unit seems like a great value and isn’t too expensive. It would add stylish extra storage to any room in your home. Well if this isn’t just the cutest little corner shelf! 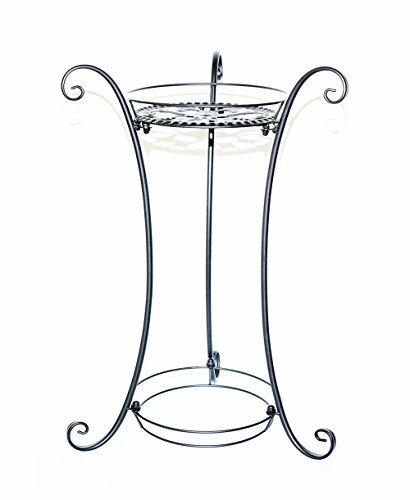 The Topeakmart 3 Tier Folding Baker’s Rack comes in a lovely coffee color and would be great for indoor or outdoor use. The shelves are on the smaller side but they would be great for books, small plants, coffee mugs, knickknacks, etc. This piece is great for small corners and adds extra storage space to any room without giving up style and decor. It’s also very sturdy--the frame is made of iron and the shelves are MDF board, so it’ll hold anything you need it to. This corner shelf is 45 inches tall, 14 inches wide, and weighs 18 pounds. What a great little addition to any room. This ladder-style corner shelf seems like it would be perfect in a kid’s bedroom or a living room. The shelves are small and can hold small toys, books or plants, while still helping keep the rest of the space organized. It comes in a 3-Tier and 4-Tier design. The 3-Tier unit is 40 inches tall, while the 4-Tier unit is 54 inches tall. The unit is made of MDF, making it sturdy and able to hold your most valuable possessions. It’s pretty light-weight--around 10 pounds--so it’s easy to move to any room you need it in. It’s got a nice white frame with brown shelves, giving it a feeling of a country home. There are no reviews on Amazon, which might indicate an issue or could just mean it’s a new product. It looks great though, so why not give it a shot! This is a great little piece to add to your home or garden. It includes three shelves that are each 12 inches across and 9 inches deep, giving plenty of room to for your plants or keepsakes. 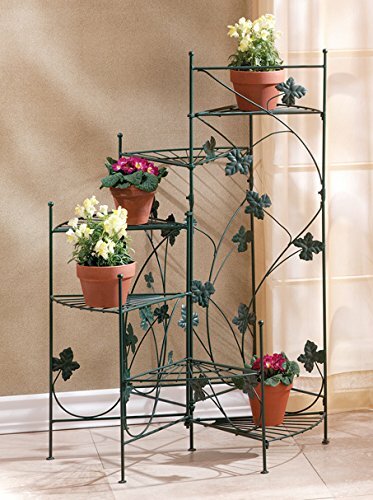 The Metal Antiqued Faux Verdigris Corner Plant Stand is great for indoor or outdoor use and at 30 inches tall, it won’t be overly imposing or take up too much space. It’s got an ornate background on the frame making it very stylish and decorative. It looks like it might hinge closed so it would be easy to move and store. There are not many reviews on Amazon, but as it looks great and is relatively inexpensive, it might be worth the risk of trying it out. It’ll look great in your living room or patio and will add a little style to any room. 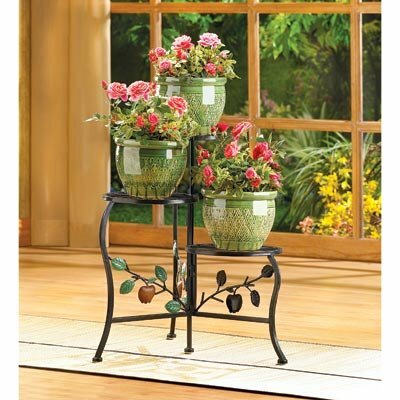 This semi-circle flower stand comes in three different colors to match any space and decor: copper, white, and black. The shelves are semi-circular and are built in a stair-step design. This piece seems like it might be specific for outdoor use and would look great on a balcony, deck, or patio. The whole unit is about 6 pounds, so it’s not very heavy, but as it’s metal it can hold all of the plants you need it to. 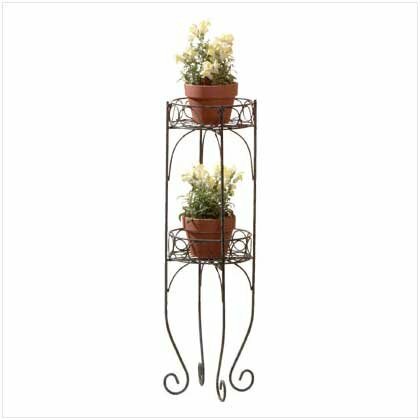 This corner plant stand would look great in any space and it has a decorative flair on the metal frame. The item description doesn’t specify how tall or wide the unit is, and so far there are no reviews of this item on Amazon. At $88, you’ll have to decide if the style is worth the risk.